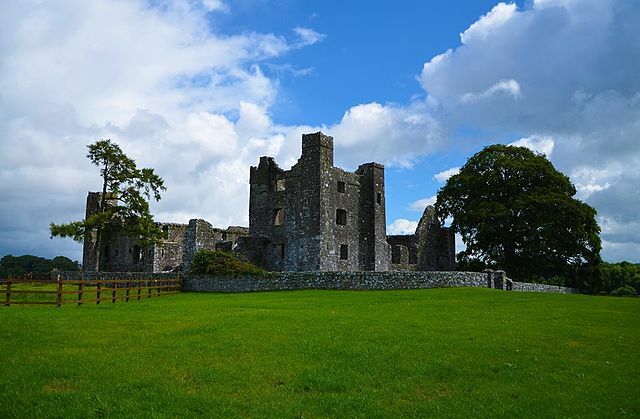 The picturesque remains of the Bective Abbey (Mainistir Bheagthí in Irish) are situated in beautiful countryside on the bank of the River Boyne in the small hamlet of Bective, County Meath, Ireland. The ruins overlook the river and stunning surroundings, and nearby is an old bridge over the river. The story of the abbey begins in the middle of the 12th century. 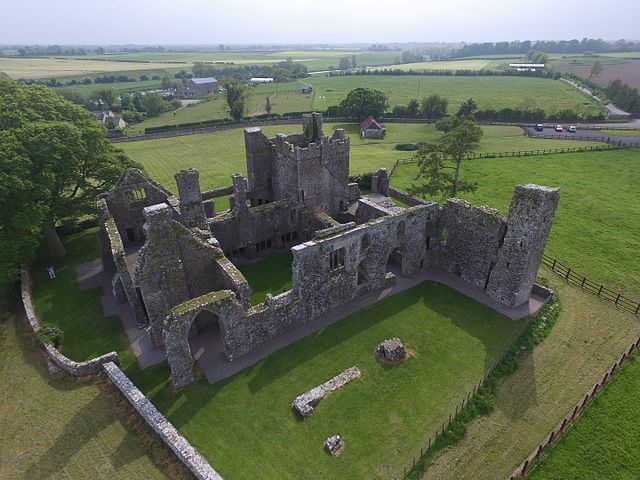 It was established in 1147 for the Cistercian Order by Murchad O’Melaghlin (or Murchad O’Maeil-Sheachlainn/ Ua Máel Sechlainn), the King of Meath (Mide), and it was the second Cistercian abbey constructed in Ireland. 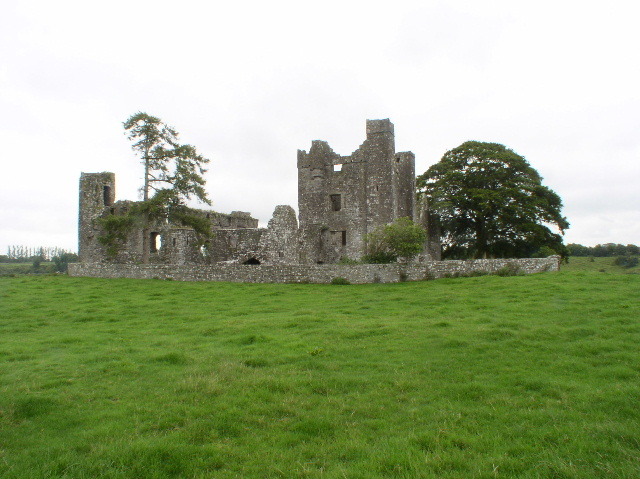 It was a daughter house to the nearby Mellifont Abbey, which was founded five years earlier. Nothing remains from the earliest phase of the abbey. The oldest remains that can be found on the site is stonework from 1274, which includes five bays of the south arcade. Much of the remaining ruins that are now visible originate mainly from the 15th century. The abbey, dedicated to the Blessed Virgin, was of great significance and had a huge impact on the region. It was one of Ireland’s most important monastic communities as its abbot was a Lord Spiritual who sat in the Parliament of the Pale. Additionally, the headless body of Hugh de Lacy, one of the most powerful Norman knights and the Anglo-Norman Lord of Meath who ordered constructing of the nearby Trim Castle, was buried here in 1195 after his murder in Durrow. 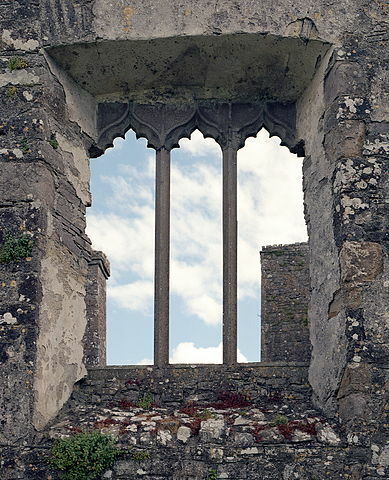 De Lacy’s head ended up in St. Thomas’s Abbey in Dublin, and in 1205, after a bitter dispute between the two abbeys, the Bishop of Meath decided that St. Thomas’s Abbey had rights over the body. It was then transferred to Dublin and Hugh de Lacy was reunited with his head. 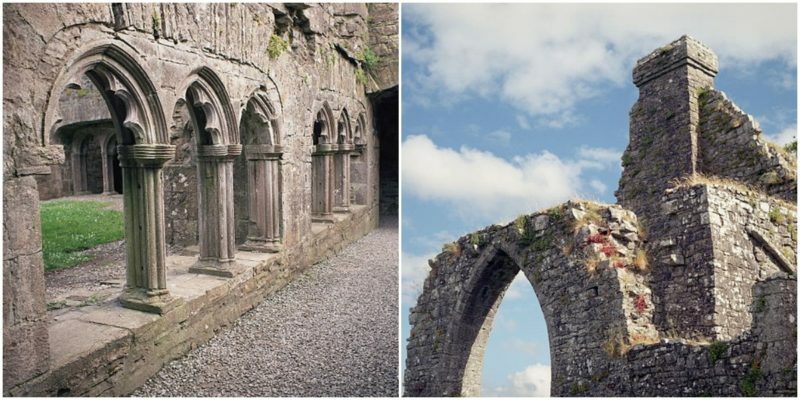 Great parts of the abbey were reconstructed during the 15th century, when the English Pale was troubled by turbulent events, and Bective became the most fortified Cistercian monastery in Ireland. A large fortified tower above the south range of the abbey was built. The nave was shortened with the construction of a new west gable and reinforced with the construction of a protective tower to the north. Minor adaptations to the cloister and the domestic buildings where the monks lived and worked were also made. The Cistercian Order was based on the principles of the simple monastic life. The monks followed strict rules and their philosophy was reflected in the architecture of their abbeys. 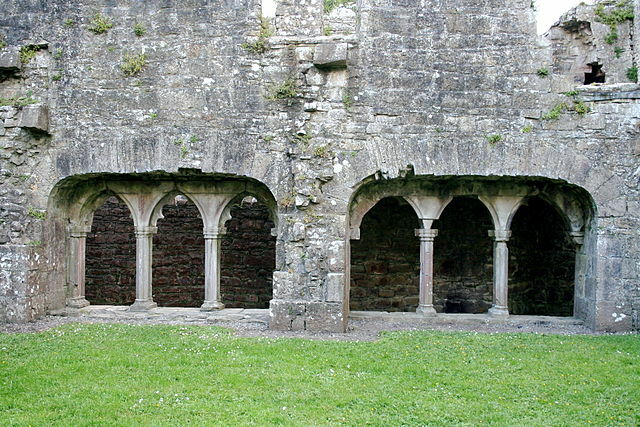 The cloister, a covered passageway for prayer and contemplation, which opened onto and encircled an enclosed central courtyard, was an essential part of their philosophy. It separated the world of the monks from that of ordinary people. But their world was not just a world of asceticism, isolation and prayer. In the dark medieval era, the abbeys represented thriving oases where creative ideas were developed and fine pieces of Christian art were created. The abbey was a self-sustained community, with its own watermill, several granges, and a fishing-weir on the river. Archaeological excavations done recently have revealed traces that clearly show the existence of a kitchen-garden and extensive cereal processing. 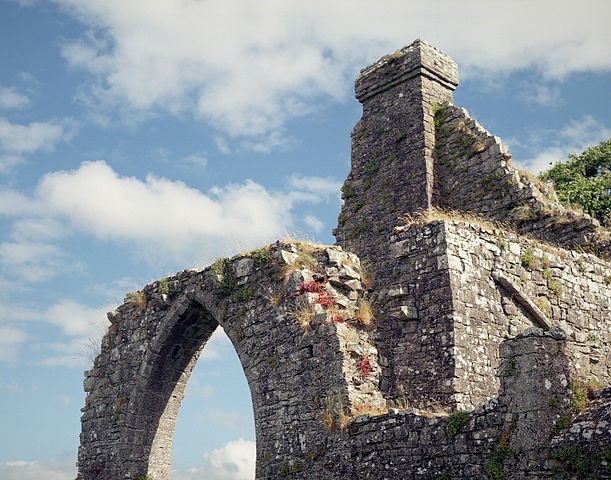 The community at Bective Abbey were mostly Anglo-Norman. In 1380, King Richard II ordered that men of Irish birth should be barred from entering the abbey’s community. 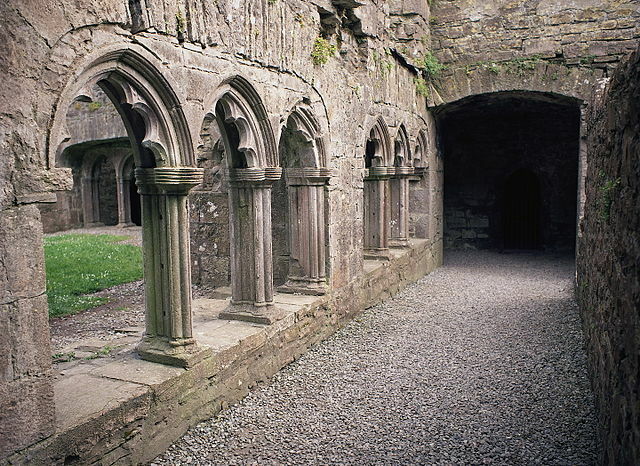 During the 15th century, the number of the monks went into decline. Monastic life at the abbey ended in the 16th century. The abbey closed down in 1536 after the Dissolution of the Monasteries ordered by Henry VIII, as part of his campaign to control the power and wealth of the church. 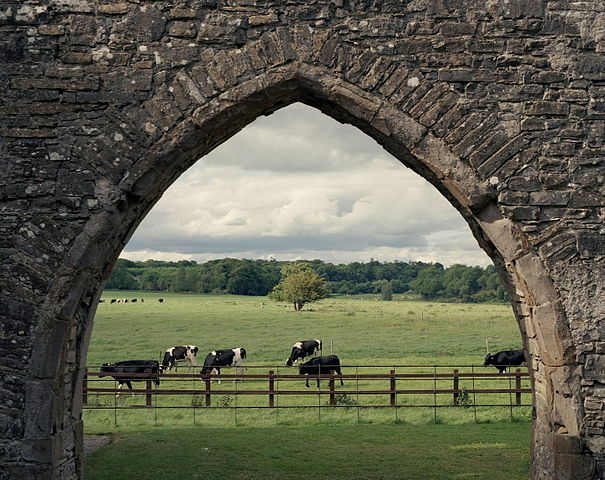 1,600 acres of land and the abbey’s buildings were confiscated. The lands were granted to civil servants as a reward for their loyalty and the complex started to be used as a fortified house. At first the land, the hall, the roofed cloister, the chambers and the other buildings, were rented to Thomas Asgard. In 1552 the former Bective Abbey was bought by Andrew Wyse. Later it passed into the hands of the Dillons and then to the Bolton family, before falling into ruin. After the Dissolution, parts of the abbey were reconstructed and converted into a great manor house. The new structure was perfectly integrated into the complex, and a combination of interesting architecture was formed with the addition of large stone windows, fireplaces and chimneys. The new structure was built around the two sides of the old cloister’s courtyard which included the two towers. The large fortified tower was altered and the complex took on even more imposing appearance. Now at the site can be seen the remains of the church, the chapter house and the cloister. 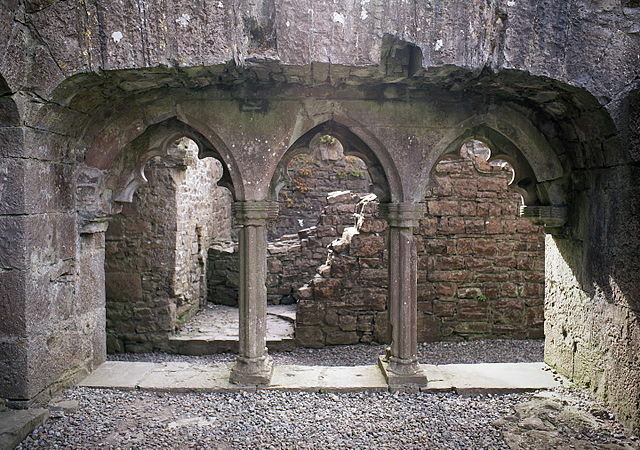 Two sections of the cloister’s walkway have survived the passage of time. 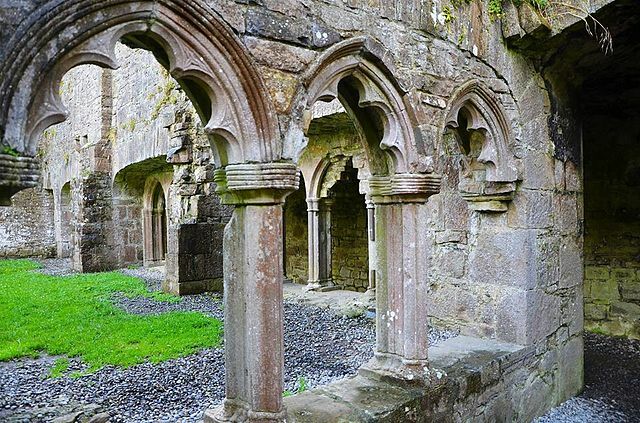 The cloister’s ruins are well preserved and their most characteristic feature is the beautiful pointed Gothic arches typical of Cistercian architecture, some of them still intact. 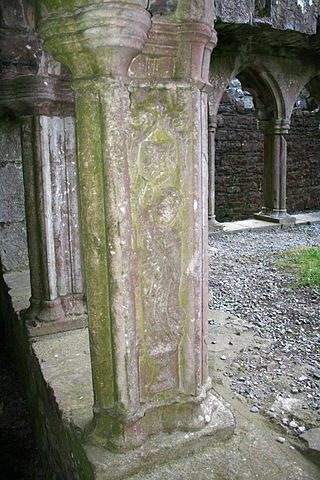 On one of the cloister’s pillars can be seen a fantastically carved figure, probably an Abbot, holding a crozier and kneeling. 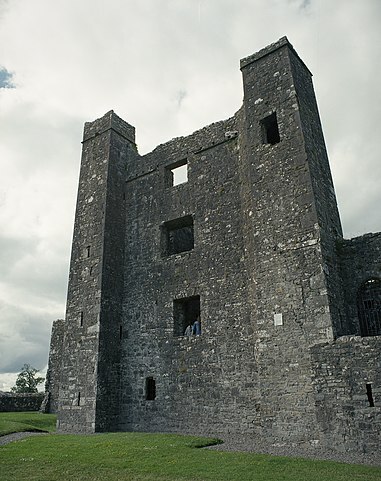 Trim Castle and the interior of the Bective Abbey (probably because of its castle-like appearance), were used as filming locations during the shooting of Mel Gibson’s 1995 historical movie Braveheart. The scene with the Princess and her maid was filmed in the cloister.